We have just been featured on Houzz!! A wonderful Recommendation for Robert Kierce Roofing!! We just received a very nice recommendation letter, Thanks so much for taking the time to let us know you were happy with the job!! I would like to voice our appreciation for a ï¿½job well doneï¿½ by your company in the way you handled, delivered, and installed our new roof under warranty. There are many layers to an organization that attributes to the overall success of that organization and yours is no different. Our experiences with Kierce Roofing, Snow Supply and CertainTeed started with Bobby Kierce. We were very impressed with his professionalism, knowledge of the business and attention to detail. He and his crew were very helpful during our conversation of figuring out what we wanted and needed for the handling of our roof. Please know how much we appreciated his personal touch and years of experience in the business. He laid out the whole schedule and process in one conversation. There were no surprises or disappointments. The entire process fell into place without a hitch. Great job by the Kierce team. The roofers were very respectful of our home and made sure Lil and I were comfortable with what was needed to be done around the property prior to stripping the roof. Installation of the CertainTeed roof was accomplished by the Kierce team. They were extremely polite, courteous and also respectful of our home. The entire team took great pride in their workmanship and attention to detail. No one likes to have their home under construction or invaded by strangers but I must say your personnel did a wonderful job. They were in and out of here within two days, just as Bobby had said. If you ever need a recommendation Bobby, please feel free to contact me. We have received quite a few calls this year from people who decided to have the "least expensive" roofer complete their home improvement project, only to find their roof leaking with the first heavy rain. To make matters worse, the original contractor is not returning phone calls and cannot be found. These days it is more difficult to make our dollars stretch a little further and for our paychecks cover a little bit more; but choosing a fly by night contractor to work on your home may end up costing you more in the end. No one wants to pay for a roof twice. As much as we feel for the people in these situations, there is very little we can do, especially when there are multiple leaks. Our only solution is to re-do the roof or that portion of the roof. Problems can arise if the original contractor used sub-par materials, or did not install the materials correctly. At Robert Kierce Roofing, we have been in business for 18 years. We live in the community in which we work, and we have pride in our work. We realize our best advertising is satisfied, happy customers. We purchase our shingles from local vendors and only use Certain Teed Shingles. We stand behind our workmanship. So check out your contractor - Trust Referrals, Check Better Business Bureau listings, Ask for Licenses & Insurance; Certificates. Thanks & Good Luck with your projects!! & Softball to build new Dugouts! Check out our business profile in this weeks Foxboro Reporter! The snow on a roof surface that is above 32ï¿½F will melt. As water flows down the roof it reaches the portion of the roof that is below 32ï¿½F and freezes. Voila!ï¿½an ice dam. Attic Insulation ï¿½ adding insulation to your attic will minimize the heat that escapes from the living space into the attic. Additionally, electric outlets, plumbing vents, furnace stacks, and bathroom vents can allow heat to escape into the attic. Roof Ventilation ï¿½ inevitably, heat will get into your attic during winter months. Proper roof ventilation allows that heat to escape and prevents your roof deck from warming. 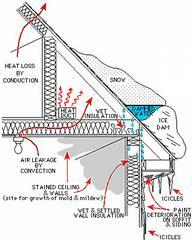 The freeze-thaw process that results in ice damming is unlikely to occur on a roof that is properly ventilated. A great holiday gift ~ Snow removal Services!! Stumped as to what to get that special person in your life? Can you hear the clock tick, tick, ticking . . .and you just feel stumped? How about the gift of Snow Removal? Its a great gift, it wont be returned because it doesn't fit, is the wrong color, or just because . . .You will make someone very happy&they will be thanking you every time it snows all winter!! We are currently plowing in Foxboro and surrounding areas. So give us a call today! Happy Holidays from all of us here at Robert Kierce Contracting! It's that time . . .
You may not want to admit it, but it is time to think about winter and winter in New England means snow and the resulting snowbanks!! Dont get stuck this year, contact us today for a free estimate! Dont Get Stuck this Winter! Call Robert Kierce Contracting today for a Free Estimate for Snow Removal! Did you see us on Channel 4 News at 11 on October 30? Clara is the Vampire - who says "Yea Trick or Treating"
and Bob is at the door handing out candy. Update Jan. 15, 2010: Form 5695, Residential Energy Credits, available on-line. WASHINGTON ï¿½ People can now weatherize their homes and be rewarded for their efforts. According to the Internal Revenue Service, homeowners making energy-saving improvements this fall can cut their winter heating bills and lower their 2009 tax bill as well. Not all energy-efficient improvements qualify for these tax credits. For that reason, homeowners should check the manufacturerï¿½s tax credit certification statement before purchasing or installing any of these improvements. The certification statement can usually be found on the manufacturerï¿½s website or with the product packaging. Normally, a homeowner can rely on this certification. The IRS cautions that the manufacturerï¿½s certification is different from the Department of Energyï¿½s Energy Star label, and not all Energy Star labeled products qualify for the tax credits. Eligible homeowners can claim both of these credits when they file their 2009 federal income tax return. Because these are credits, not deductions, they increase a taxpayerï¿½s refund or reduce the tax he or she owes. An eligible taxpayer can claim these credits, regardless of whether he or she itemizes deductions on Schedule A. Use Form 5695, Residential Energy Credits, to figure and claim these credits. Old Man Winter is fast approaching! Most of us here in New England donï¿½t really look forward to the winter months; I understand the winter sports enthusiasts, the skiers, snowboarders, or snowshoerï¿½s. Sure the winter months bring us the holiday season, the beauty of the first snowfall, the opportunity for relaxing in front of the fireplace, and of course the Super Bowl (Go Pats!) but for a lot of us it is month after month where we just wait for spring! So with winter fast approaching, we at Robert Kierce Roofing felt that it was an appropriate time to cover some details about winterizing your home. The winter weather can take quite a toll on our homes, and the old adage still applies; one ounce of prevention is worth a pound of cure. ï¿½ Check ceiling and interior walls for signs of leaks (stains). If you find any, take the time to seal all roof leaks or give Bob at Robert Kierce Roofing a call. For once the roof is covered in snow, it is nearly impossible to locate the source of leaks. ï¿½ Once the leaves fall, check and clear all gutters, downspouts and scuppers of any leaves or debris, and make sure that all drains are working properly. The weight of the water in an improperly functioning gutter system can loosen the attachment of the guttering from the structure. It is important that drainage water moves freely through the gutters and drains away from the house. This is an important step in the prevention of Ice Dams. ï¿½ Check the weather-stripping on your doors and windows, including those in the basement or attic, as they may deteriorate over time due to the elements. ï¿½ Inspect your storm windows; check all the glass storm windows for cracks and other damage. If most of your homeï¿½s windows are old and drafty, it may smart to invest the cash to replace them. If you cannot afford to redo all the windows, start with those located in the most frequently used room or all on one floor. There are often rebate programs or assistance for replacing windows and making your home more energy efficient. Also, there are IRS energy-efficient tax credits you can qualify for if you install new energy efficient windows. There are many manufacturers that offer energy efficient windows that qualify for the IRS tax credit. And remember Robert Kierce Roofing is your partner in helping you decide how to maximize your homeï¿½s value through tastefully selecting and professionally installing various roofing, gutter, replacement window as well as exterior and interior painting options. Call Bob today at 508-698-3806 today to discuss your needs. You can also find us on the web at www.RobertKierceRoofing.com. We are a family-owned company with 18 years of experience in helping homeowners like you protect and improve your most valuable asset, your home. We are licensed and insured and accredited with the Better Business Bureau. Even in this economy, it is important to care for one of the major investments you have made . . . Your Home! Remember Robert Kierce Roofing can help you make educated decisions on the things in your home which will protect your investment and add value to your home. Robert Kierce not only does Roofing, but Replacement Windows, Gutters, Exterior Painting, Decks, Installation of Skylights. He also has a extensive network of contractors who he works with that can provide a variety of other services. So Give Bob a call (508)698-3806!! Thanks for checking us out and Good Luck !